Back mid-summer I started working on my son’s room. Oddly enough, I had wanted to get him into his new room before we started trying for our second child, but within weeks of starting his room I found out I was indeed ALREADY pregnant (ironic, huh?!). So I kind of had to sideline his room makeover for quite a while because I was so exhausted in my first trimester. Fast forward 28 weeks and hear I am finally finishing up the room and sharing it with you this week. 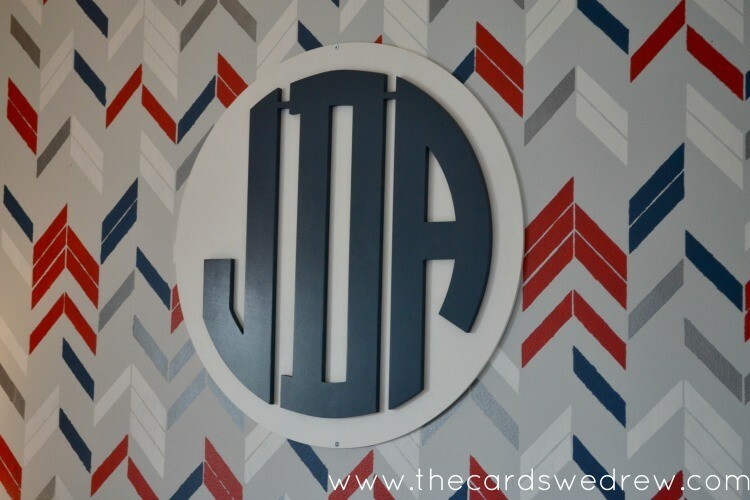 Today I’m showing you how I stenciled the wall behind his bed to create a Stenciled Headboard using Royal Design Studios Stencils and using a wall monogram from Southern Nest to bring it all together. 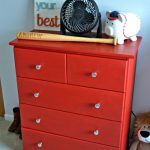 If you recall, I’ve already shared how I made over his furniture by painting it red with Annie Sloan Chalk Paint and I also did DIY fabric drawer liners with striped navy fabric that I got from Online Fabric Store. 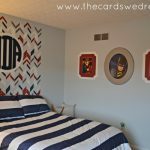 Now I can finally share how I complimented his West Elm Navy Striped bedding with a fun Herringbone Shuffle Wall Stencil from Royal Design Studios. 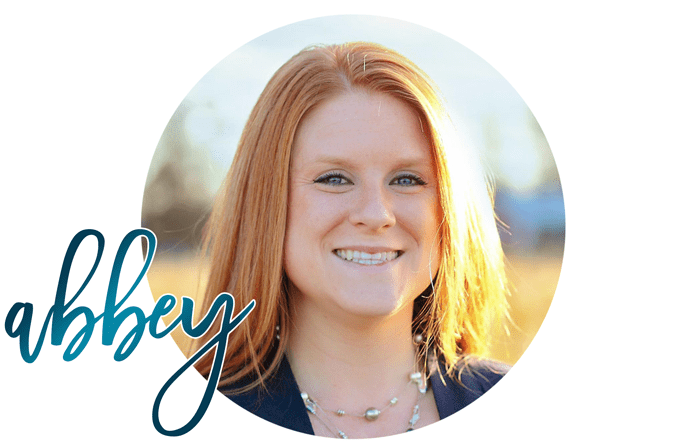 I’ve worked on several stenciling projects throughout my house by now where you can find tips and how to’s on stenciling walls, shelves, curtains and more. But this stencil by far was the most challenging given the multi-colors that I used. It takes a lot of time and you really just need to take your time and be patient with the whole process. 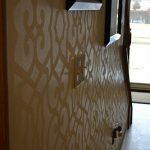 Visit THIS post or THIS post for other stenciling projects on my blog. To start, my husband repainted the bedroom a light gray color and painted all the trim in the room white. Once we painted our base coat we purchased 3 pots of paint from Lowe’s in small tester pots that including white, navy blue, and red (specific colors were Valspar Crimson, Valspar Midnight, and Valspar Ultra White). I also was given a small pot of Modern Masters Metallic Paint in Pewter that I used for the project, as well. I measured to the middle point of my wall and then lined up the middle of the stencil with that point and started there. At first I couldn’t decide if I wanted to do the whole wall or just behind the bed, but after seeing some great inspirational ideas like THIS and THIS sent over by Royal Design Studios I decided to use it as a headboard behind the bed. I have a lot of patterns in this room and I didn’t want to overwhelm the room with too much pattern. I purchased this AWESOME custom monogram for above the bed from Southern Nest. 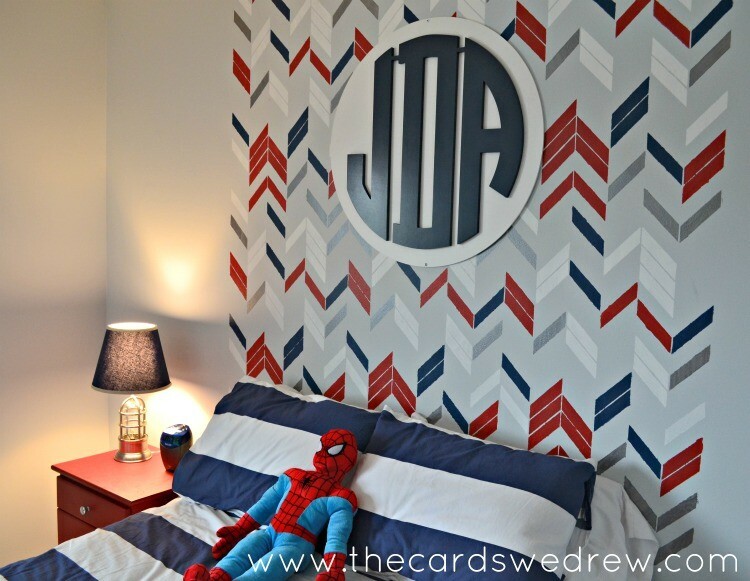 I’ve always been a big fan of monograms (our own bedroom has monogrammed bedding and sheets), so I really wanted to incorporate a monogram into Andrew’s bedroom. I think it adds a classic, preppy element to the room that we’ll use for bedrooms to come as he grows up. Overall, I love how his room turned out…I have a few more tutorials to show you still that will help you out if you’re trying to update your little boys bedroom. The best part though? Today I get to giveaway a stencil to one lucky reader to try your hand at stenciling your very own work in progress whether it be a child’s bedroom, bathroom, living room, or kitchen. Enter using Rafflecopter widget below. 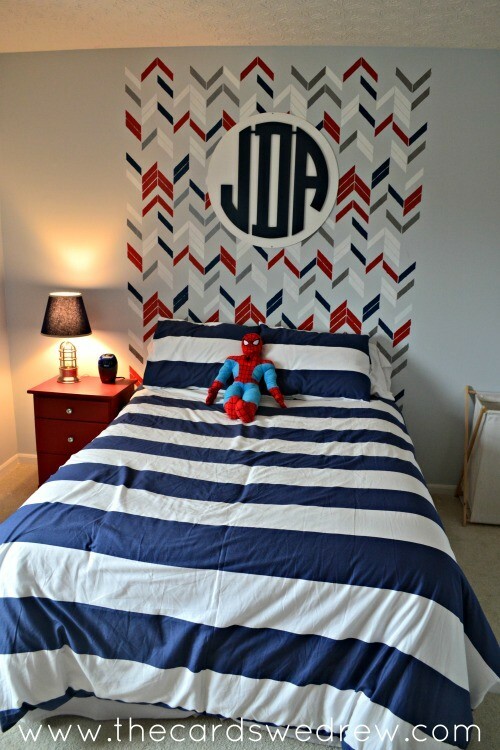 Visit SOUTHERN NEST for more information about monograms for your child’s room. Visit MODERN MASTERS for more information about metallic paints. I really want the Casablanca Trellis Moroccan Stencil. It is the pattern I keep seeing in my mind for my kitchen redo! I just love it! I would love Rockin Roses! 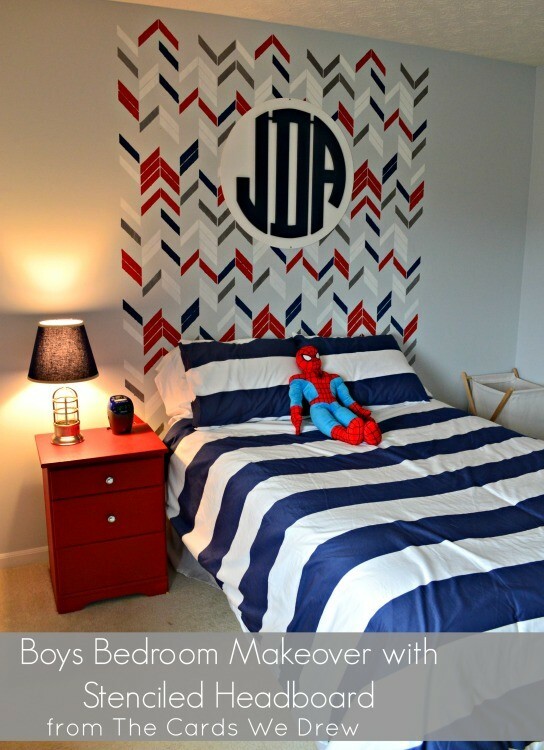 I would love the polka dot stencil, as my oldest wants a polka dotted wall! I like the Hip to be Square Stencil. that looks so stinking good!! What a great idea to use this stencil as a headboard Abbey!! It’s perfect for this room. Thanks for sharing a great project with our stencils!!! How am I supposed to choose! There are too many I want! lol. I’d probably pick a bird or polka dot one. The room looks great! I’ve used these stencils on a few pieces of furniture! Love them! I would have to be a copycat and get the herringbone! Probably Large lace doilies set… but this is a hard decision! :0) There are so many great choices! I love the big bloomers stencil set and so many more. I love the starry night stencil! 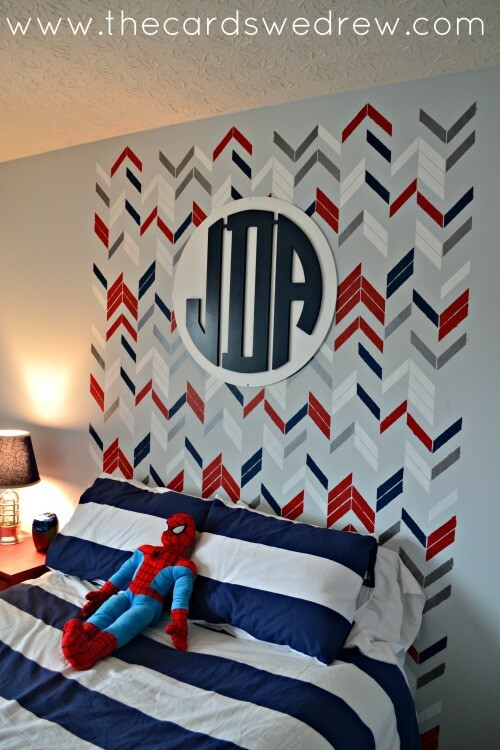 This is an amazing little boys room! You did a great job. I really like the sonic border stencil. I love the herringbone furniture stencil! I love the Magarita Lace stencil! I love the Spanish Style lace one! Love the Casablanca trellis but after seeing this post, I reallllllyyy love the herringbone!! 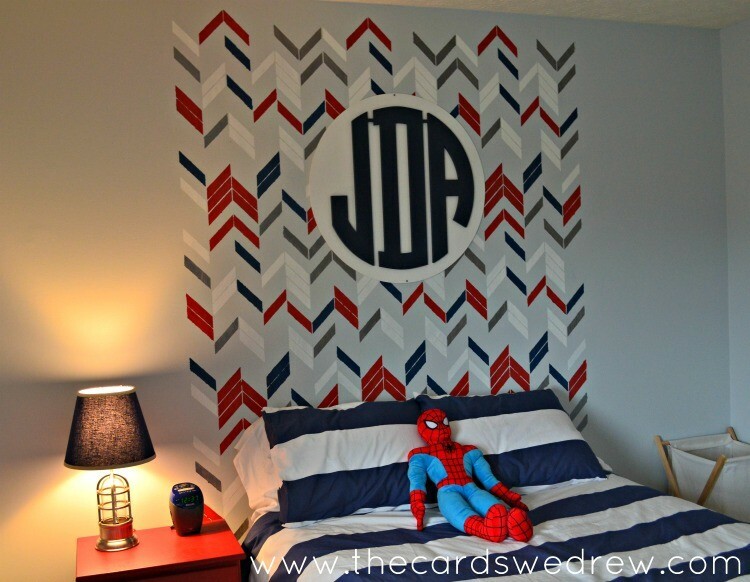 I like the modern chevron stencil! That is so awesome, I love the colors you picked. I might choose the Large Allover Brocade Stencil. Love how this turned out! I love love love the stencil you chose! I love so many of these stencils it was very hard to chose one. 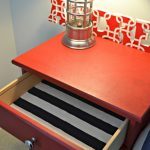 I really loved the Herringbone Shuffle Stencil you used. My favorite is Casablanca Trellis Moroccan Stencil.